The present church in the town is dedicated to St Mary. 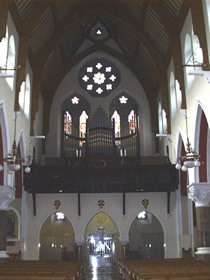 J.J. McCarthy of Dublin designed the church in a Gothic-revival style during James O'Shea's term as parish priest from 1864 to 1877. However, Fr O'Shea died in 1877 and did not get to see the spire. 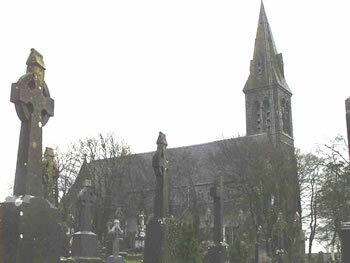 The tower and spire of the church were completed in 1881 by Archdeacon Halpin, who dedicated them to the memory of his predecessor James O'Shea. The church bell was installed in 1882. The architect of the church, J. J. McCarthy, was also the architect of the church of SS Peter and Paul in Kilmallock, which was built in 1878. A large marble plaque by the right side door mentions all the donors and their donations to the church. The Magnor family donated the site of the church and the graveyard. Patrick Hartigan and his family donated the Stations of the Cross to the church in 1874. 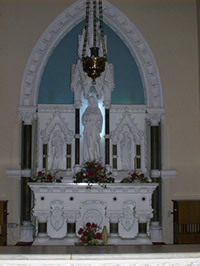 There are three plaques in the church, one of which commemorates Dean Costello's 70 years as a priest, while the other two are in memory of two former parish priests of Rathkeale; William Molony who died on November 7th 1901 and Archdeacon Halpin who was parish priest from 1877 until his death in 1884, aged 74. At the back of the church on the right there is a mosaic of the Angel Gabriel that was given to the church by General and Mrs. Lloyd of Beechmount. The mosaic was given in memory of their only child T. H. Eyre who was a Captain of the Coldstream Guards. Eyre was killed at Brakeenlaagte; Transvaal, South Africa during the Boer War on October 31st 1901, aged 30. Inside the church on the left there is a shrine to Jesus on the Cross. 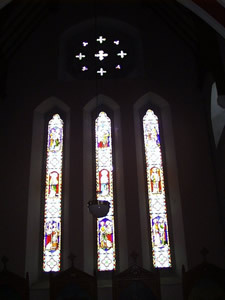 A three-sectioned stained glass window was erected in 1973 to commemorate the 100th anniversary of the opening of Rathkeale church. The three sections depict (from left to right) the keys of Heaven, the Holy Spirit and the Body and Bread. The next stained glass window is also in three sections and depicts the Queen of Heaven, Jesus and an Apostle, and the dove of peace/the Holy Spirit. Underneath the window a plaque asks people to pray for Nora McMahon and her family. Another stained glass window shows scenes from the Rosary, which shows the Assumption of Mary into Heaven and the Resurrection of Jesus from the tomb in the left panel. The middle panel depicts Jesus on the mountain with Elijah and Moses and Pentecost Sunday. The right panel shows Mary, Queen of Heaven and the Ascension into Heaven. The inscription under the window asks that people pray for Minnie Madigan and her relatives. Over the Confessional on the left-hand side, there is a large stained glass window that was the gift of a number of families in the parish. Again the stained glass window is divided into three sections. The left section has three levels which depict (from the top) St Matthew and St Mark, St John the Baptist and St Augustine and St Ambrose. The middle section shows St Dominic, St Patrick and St Liguori while the right section depicts St Luke and St John, St Helen and St Jerome and St Gregory. Near this stained glass window, there are two plaques. The first plaque tells us that Patrick Hartigan and family gave the Stations of the Cross in 1874. There is also a plaque to Dean Canon Costello PP who was a Dean from 1964 until 1989 when he resigned both titles. The plaque also states that Dean Canon Costello celebrated 70 years as a priest on June 20 1995. Dean Costello died on June 17 1996. Over the plaque there is a picture of the Sacred Heart. There is an altar to Sacred Heart at the top left of the church. 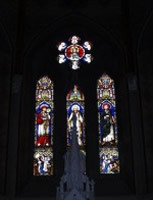 Over the altar of the Sacred Heart, there is a stained glass window of Mary, Jesus and Joseph. 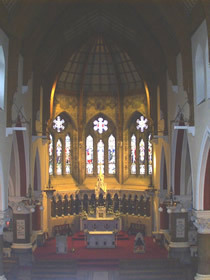 To the left of the altar there is a stained glass window of the Annunciation and the Sacred Heart appearing to St Margaret Mary. At the top of the church on the right there is an altar to the Virgin Mary. Also in the church there is an Adoration chapel. At the back of this small chapel there is a stained glass window of the Lamb of God that is to the memory of Dean Thomas Costello PP. Murals underneath these stained glass windows depict a number of saints: St James the Great, St Francis, St Philip Nero, St Maria of Pisa, St John, St Anne, St Catherine, the Lamb of God with a flag, St David, St Susanna, St Thomas, St Mary Magdalene, St Robert, St Elizabeth and St Charles Borroma. This mosaic work was at the bequest of W. J. Hayes. There are small stained glass windows to the right of the altar. 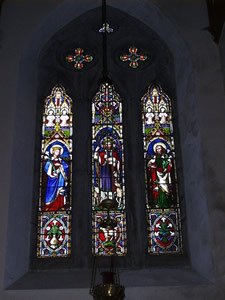 They depict the Virgin Mary, St James the Greater, St Munchin and St George. 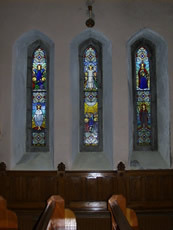 Fr James O'Shea PP of Rathkeale donated these windows. 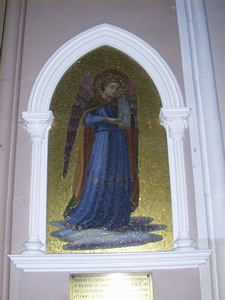 There is a small stained glass window of an angel on either side of the altar. The stained glass windows above the choir gallery show Christ the King in the small centre window with underneath (from left to right) St Patrick, St Bridget, St Bertha the Abbess and St William the abbot. 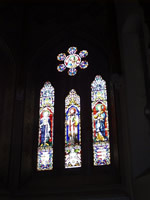 Lord Emly, William Maunsell, donated the window in 1873. On the right hand side of the church there is a stained glass window showing three scenes from Moses' life: Moses being found as a baby, the burning bush and the Ten Commandments. The inscription on the window is to Patrick Slattery and his family. 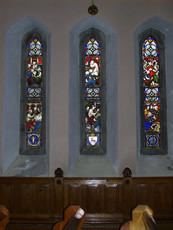 There is also a stained glass window in memory of Garda Peter Macauley and his wife Mary Josephine. The window shows the Sermon on the Mount. The parishioners erected a stained glass window of the Parable of the Farmer sowing seed to commemorate the Diamond Jubilee of Dean Thomas Costello who celebrated the 60th anniversary of his ordination in 1985. James J. McCarthy, the architect of the church, also donated a stained glass window. On the left, this window depicts the Last Supper and Mary Magdalene washing the feet of Jesus. The middle panel shows the Agony in the Garden of Gethsemane and Jesus entering Jerusalem on Palm Sunday. The right window depicts Judas betraying Jesus with a kiss and the cutting off of the servant's ear. Underneath this scene there is a depiction of the Washing of the Feet at the Last Supper. The large stained glass window in the right transept is divided in three sections with three levels to each section. 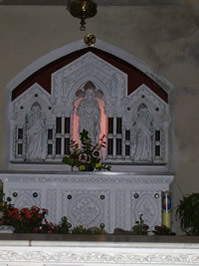 The middle level shows St Brigid, the Blessed Virgin and St Timothy. The rest of the window shows the Twelve Apostles with the words of the Apostles Creed throughout the window.